Hi foodies...Welcome to AYESHA'S KITCHEN. Here is the recipe of quick instant semolina idli / rava idli recipe without fermentation. Rava idli or Semolina idly is one of the simplest and healthiest South Indian cuisine which combines the goodness of many spices in a single dish. Nowadays such instant ready made rava / semolina idli pack is available in markets. 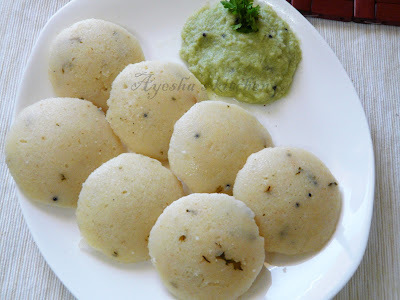 But at the same time it is very simple to make the preservative free semolina / rava idli at home which is more healthy and tasty. I love to make rawa idli than the other idli's as it is free from grinding and fermentation. Heat oil in a pan and splutter mustard seeds. When done add chana dal, cumin seeds and fry until golden. Now add asafoetida and now add the semolina along with some salt and mix well. Remove from flame and add curd along with 1 cup of water. Mix well to form a thick batter. 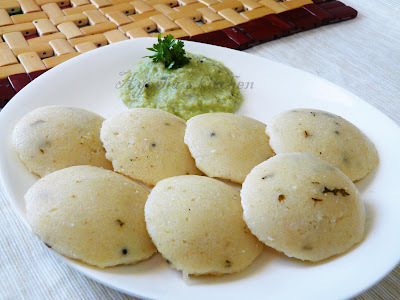 Do not add more water and the consistency is same like normal idli batter. Keep some water ready for steaming in the idli cooker and make sure its hot before proceeding with the batter. Now grease the idli moulds with some oil and now add the eno salt to the batter, mix lightly. The eno salt makes the rawa idli soft and spongy. Pour immediately into the moulds after adding eno salt and if you are steaming in batches, add eno salt only to the batch that you are going to steam and the rest before the next batch only. Steam for 10 minutes. The time of steaming depends upon the size of the mould. Serve with sambar and green chutney.